YIKES! Where has the time gone??? My apologies for not posting in over a week...and missing my Sunny Sunday Sketch!!! I'm going to try and backtrack and get that up tomorrow for this past Sunday. 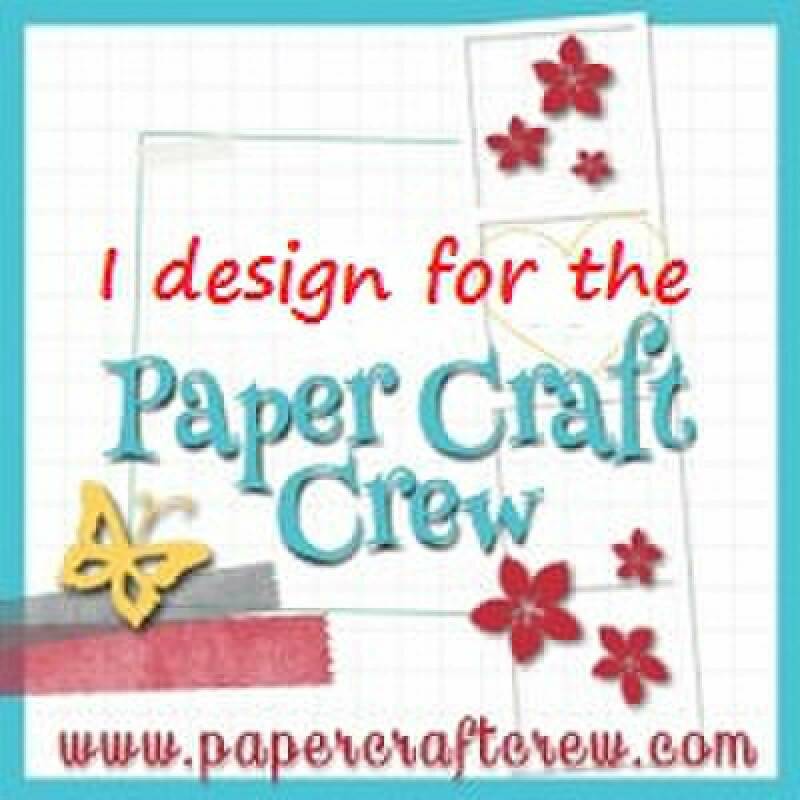 In other news, the thing that has kept me so busy was getting ready for Stampin' UP! Regionals in Hamilton. What a great day we had! See? At the end of the day we got together for the Canadians, INK! group shot and Shelli was kind enough to pose with us. How lucky are we??? 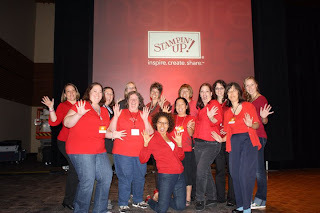 You too can attend a Regional or any other Stampin' UP! event, just by becoming a demonstrator!!! It's easy and I can show you how! This is a little late in the day, but at least it's before dinner - LOL! Well...at least in my part of the world! Earlier this week, I got an email in my inbox from the wonderfully amazing Gretchen Barron. Ok...it didn't come DIRECTLY to me, but to one of the groups in which I participate, but still...we're talking Gretchen Barron here people! It seems the Utah Divas have just introduced a colour challenge on their blog. I decided to play along! Believe it or not, this is REALLY a 20-minute card...less than that actually! The background only LOOKS like it took a long time to complete. I used my sponges and my ink pads to sponge what I think is a pretty decent looking sunset. I had to cheat a bit and use some Pumpkin Pie because the sunset just didn't look right without it. Then, I stamped the single tall tree from Lovely as a Tree in Early Espresso. I don't know if you can tell, but I also added some Champagne Shimmer Paint all over the place. Good morning friends!!! It's Sunday and that means it's "Sunny Sunday Sketch" time! 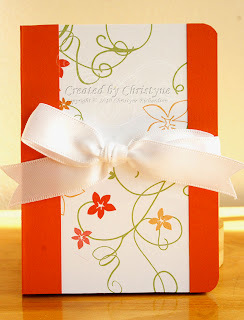 Ever since I got the Extreme Elements set from my friend Janet, I have been wanting to do a card like this one. I stamped the OSW a week ago (you'll remember it from this post) and still had some of it sitting out on my table. I decided to use up some more of it for this card. My base is Marina Mist and my square panels are matted using Night of Navy. I had fun inking up edges! I don't know if this qualifies as Whimsical Wednesday because there isn't any stamping on it. Either way...it's cute!!! These little books were given to my "Vegas Besties" yesterday. Except for My Caroline, I only get to see Karen and Josée once a year. I hope to see Fanny every year too and I hope to keep doing this for a VERY long time! I'm sure there are a lot of people who think I'm absolutely NUTS, but I wouldn't have it any other way. Last year, this trip was done on a whim to help celebrate my BFF's birthday. This year, we PLANNED it! Yes...12 hours in Vegas. It's an absolute whirlwind to be sure, but I LOVE IT!!! Anyway, I had these tiny composition books that I picked up last year at Target (I think we were in Minneapolis) and I covered them up using Sunny Garden DSP and Tangerine Tango Cardstock. I attached the white ribbon under the "binding". What do you think? I just love today's ATC! As I am winging my way to Vegas (I won't tell you what time I had to get up! ), this post is set to automatically pop up. 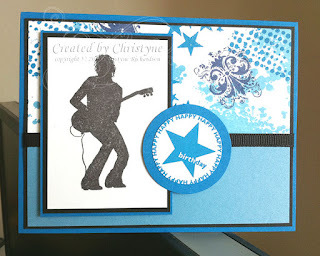 I stamped the image from Matchbox Messages in Rich Razzleberry on Whisper White and punched it out using my 1 1/4" circle punch. It was matted on a 1 3/8" punched circle of Rich Razzleberry and adhered to the front of the ATC using Stampin' Dimensionals. I just LOVE the magic bow maker that my FIL made for me while I was there visiting last weekend. It makes PERFECT bows every single time! I used it to tie my Pretty in Pink bow for my embellishment. First, I'd like to apologize for this incredibly late posting of my Sunny Sunday Sketch. The kids are back at school and this week has been completely hectic! Don't get me wrong, I LOVE that the kids are back in school (can you hear me now? It's SO quiet in here during the day), but it will take a bit to get back into the groove and make sure everyone is where they need to be when they need to be and make sure they have everything they need - PHEW! So, better late than never, right? My sketch and card come from a card that I found as I was looking for something to create for my Vegas besties. I'll be working on those tomorrow, but they won't be posted till Wednesday, because I was my friends to have their gifts in hand before they see them on my blog. I'm not going to show you the inside, because that's full of mush as I gave the card to my hubby. I was thinking the other day about how lucky I am. For 15 years (almost 16 now), I've been a stay at home mom. Even when DH took a HUGE pay cut as he changed companies, he did whatever had to be done in order to make sure that I could stay home. I am a FIRM believer that children should be raised by their parents. PLEASE don't shoot me if this is not your belief. Everyone has their own set of beliefs. Anyway, I thought I should thank him for everything that he does. 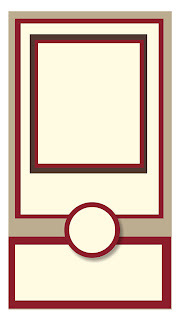 The card is a fun little size - 3 1/4" X 6 1/4". It's made out of a piece of 3 1/4 X 11" cardstock, scored at 6 1/4". 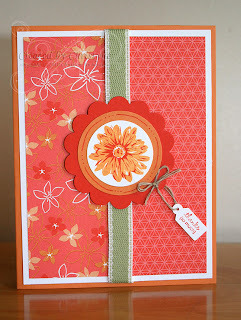 The little circle (on a Stampin' Dimensional) is the piece that holds the top piece closed. Since my Caroline is going to Vegas on Tuesday too, I was able to steal borrow her French Foliage set of Clear Mount stamps to make this card. I only get to keep it for this week, so I may just have to order my own! I just love it! Good morning friends! Hope you all had a GREAT week. For today's post, I thought I'd go back to basics...when all that was available were stamps and ink. To do that, I made my own Designer Series Paper using the OSW (One Sheet Wonder) technique. The thing I just love about this technique is that if you have the ink to match the paper your project will always look great! And you never have to worry about having the DSP that will look "just right" with your project. Not that I want you to STOP buying DSP - let's not get crazy here - LOL! The way to make an OSW is to start off with your biggest stamp and your lightest colour...at least that's what I do! The general idea is to use 3 or 4 stamps (I usually choose ones from the same set) and 3 coordinating colours and just get to work. Your sheet of paper (in this case Whisper White 8 1/2 X 11) must be full. 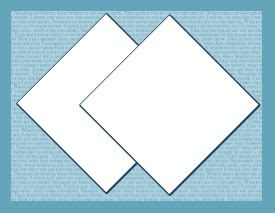 When you're done, you cut the sheet into several pieces (following a template or freehand) and use those pieces on your cards. For today's card, I just cut a piece of my OSW to 3 7/8" X 5 1/8". I ended up covering the bottom half of it with a strip of Marina Mist, so I probably could have cut the piece of OSW a bit smaller. Oh well! Live and Learn - LOL! So, after cutting my OSW, I adhered it to a piece of Basic Black cut to 4 X 5 1/4". I then added a piece of Marina Mist to the bottom half of the card. My one little "cheat" (not a basic) was the black ribbon I used to hide the seam between the two pieces. 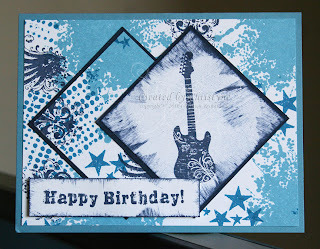 My stamped image is the "Extreme Guitar" stamped on Whisper White and matted on Basic Black and Pacific Point. 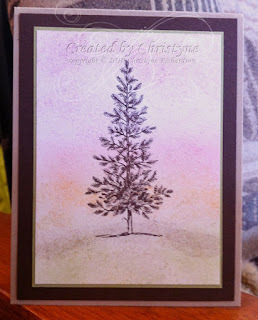 It's adhered to the front of the card using Stampin' Dimensionals. The last little touch was the sentiment stamped in Pacific Point on Whisper White and matted on a piece of 1 3/4" Pacific Point. Good morning everyone and welcome to another instalment of ATC Tuesday. First things first...can you hear the silence? Isn't it wonderful? The kids are all back at school and I have the house to myself. What a glorious day! Don't get wrong, I do like summer...the sleeping in, the not having to be anywhere for a certain time, the spontaneity of being able to change plans at a moments notice...it's all good stuff. But let me tell you...those first golden moments of silence once all the kids are out of the house are absolutely divine! I used the direct to rubber technique colouring the image with Tempting Turquoise, Tangerine Tango and Real Red. I tell you, I was SO sad when they retired "Simply Thanks", but I love this new "So Many Thanks" single stamp and I know you will too! I don't have a square punch the right size to punch out this particular image, so I had to trim it using my Tabletop Cutter. That didn't quite work out the way I would have liked, so I took my scissors to it and trimmed it by hand. Then, I matted it in on a piece of 2 1/4 X 3 1/4" Tempting Turquoise. The Tempting Turquoise was matted onto a piece of Real Red, around which I tied the 5 /8" grosgrain ribbon. 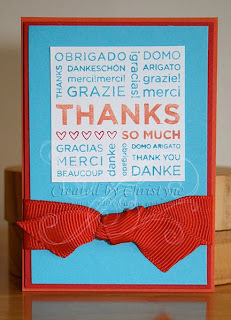 The Tempting Turquoise/Real Red Panel was matted to the 2 1/2 X 3 1/2" piece of Tangerine Tango using Stampin' Dimensionals. OK, so I tried that whole fifteen minute Friday thing, and that didn't work out! However, I have discovered that I CAN actually create a card in 20 minutes...provided I have a sketch! So, welcome to 20-minute Monday! This feature will be replacing Manic Monday. Last Friday, I had GREAT intentions of playing along with Diana's Chat and Challenge at SUDSOL, but time got away from me and dinner didn't get on the table on time...and well, you know how THAT goes! I used Peach Parfait as the base and then added a layer of Whisper White before adhering my pieces of Sunny Garden DSP. I stamped my flower from Greenhouse Garden in Peach Parfait and Poppy Parade. 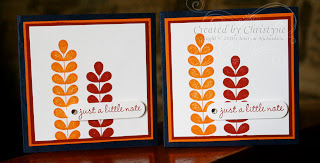 I just LOVE 2-step stampin'! Even my DH was impressed - he said the flower looked very realistic! I punched it out using my 1 3/8" punch and matted it on a piece of Peach Parfait punched with my 1 3/4" punch. The two pieces were added to a piece of Poppy Parade punched using the 2 3/8" scalloped circle punch. The Pear Pizzazz ribbon covered up the space between the two pieces of DSP (oops! I shouldn't have told you that - LOL!) and the finishing touch was the tiny tag stamped with "Thanks so much" from Tiny Tags attached with a piece of linen thread. It's another week of Sunny Sunday Sketch!!! Week 15...that's a milestone, right? I used the 6 X 6 card design in MDS, but my cards are just 3 X 3 - SO cute!!! I used a colour combination that I used in this post. You'll remember that I used after consulting my Colour Coach - I'm still loving it! 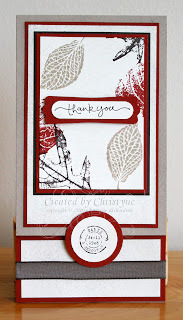 I stamped my images from "Apple Blossoms" (level 2 hostess set) using Pumpkin Pie and Cherry Cobbler inks. 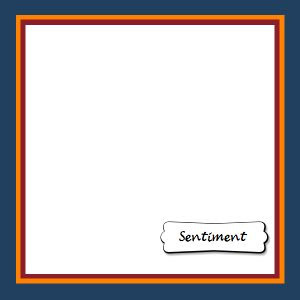 My sentiment (from the same set) was also stamped in Cherry Cobbler on Whisper White and punched out using the Word Window Punch. Rather than matting it on a different colour of cardstock, I just adhered it to the front of the card using Stampin' Dimensionals. The finishing touch was a Basic Rhinestone. My Saturday posts have been "Simple Saturday" for a little while...well, except for the Saturdays where I went missing - LOL! 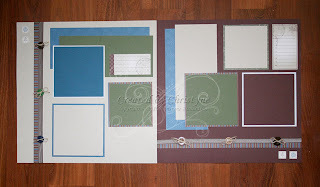 This week, I thought I'd try something a little different and show you some scrapbooking pages! Now, it's been a LONG time since I've done any scrapbooking at all and even LONGER since I scrapped using REAL paper! 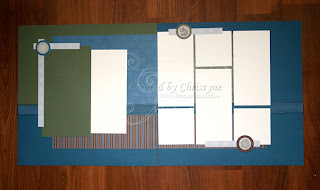 I used the pieces I had left over from a demo I did last year at Stampin' Palooza with my Caroline. So, the Scrappin' Kit is retired, but you could do the same thing with any of the kits now available in the 2010-2011 Idea Book and Catalog. I didn't have a full two 12 X 12 pages left from the kit, so rather than pull from another kit, I pieced together the left hand page. Necessity is the mother of invention, right? I think it turned out pretty good! It looks like I planned it that way! Holiday Mini is LIVE!!! Stampin' UP! rocks! Have you ever considered joining Stampin' UP? Now is the perfect time! Not only will you earn extra cash for the holidays (or to buy more stamps! ), but from now until the 18th of October when you decide to join Stampin' UP! not only will you get a FABULOUS starter kit, you'll also get this Greenhouse Gala Tote delivered right to your door! And how amazing is this tote? It's SO roomy and has all kinds of compartments and pockets. If you take the accessories off your Table Top Trimmer, it will fit in the middle pocket. I don't know about you, but that was reason enough to own it for me! And besides...there's no such thing as too many totes, right? If you haven't seen it yet, the HOLIDAY MINI is officially LIVE! This is by far the biggest and best Holiday Mini EVER! 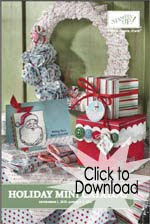 Forty-two pages of stamping, scrapbooking, fabric, jewelry, decorating holiday goodness - covering everything from Thanksgiving to Halloween and Christmas and continuing right through to Valentine's Day. There's something for everyone and you won't want to miss out! If you prefer a print copy and you live in Canada, please not hesitate to contact me and I'll be happy to put one in the mail for you.